Not long after I joined the Aeclectic Tarot Forum, I started an informal study group in hopes of going through the Rider-Waite deck and distilling out what most readers felt were good, basic meanings for beginners to learn. These pages and eBook are the result. Over the years, I have tweaked these meanings. This particular edition, however, has the most changes as I tried to consolidate all I'd learned in the intervening years with the some of the original, Rider-Waite meanings into a comprehensive whole. I pass this onto you with blessings and a warm welcome onto the Path of the Tarot. It is a never ending, but always fascinating journey. There are many ways to learn the cards. Key words is a popular method, where the student assigns "key" words to each card and memorizes them like flash cards. So "Fool" is given a key word like "beginnings" and any time it turns up, that is what the reader thinks. Another popular method is journal writing, where the student creates their own tarot book by writing down either their personal impressions or a combination of book meanings and impressions in a journal. Some students rely on meditation, going over a card a day, even sleeping with them under their pillows. Some take classes in tarot reading, some use old fashioned memorization. Most, however, rely on books. Books have their pros and cons. On the pro side, the student gets an overview of agreed on meanings, an idea of the history of the cards and the meaning of the symbols used. However, there is a tendency for books to overwhelm the student with too much information. Also, students have a bad habit of carrying their books around with them, looking up meanings every time they lay down cards. While very common, flipping through a book to remind you what the card is about is not a very good way to learn tarot. The best way to use books is to take in what seems important to you, personally, about the card as you read the explanation. So when you read about the Fool, you may be struck by the fact that he is about being foolish. That is certainly enough to start. Some time later, when you're more familiar with the deck, you may re-read this book, and be struck by the "new beginnings" aspect of the Fool. You'll add that to your "foolish" meaning. And still later, you may read over the meaning again and find that the "caution" symbolized by the dog seems important. In short, you do not have to remember or be reminded of all the possible meanings the book gives you about the Fool. You start with what strikes you and add on, bit by bit. 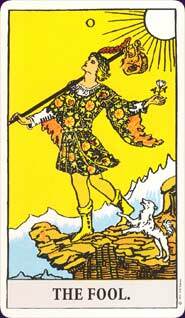 Very soon, you will not only have a very layered view of the Fool to draw on in interpreting him, but find that new insights and ideas are occurring to you, no book required. Another thing to keep in mind is that the book meanings are not exact meanings, nor the only meanings. They are general and basic so that they can cover any topic from car repair to a spiritual crises to internet chat rooms. Think of such books, including this one, like reading primers. The student learns that "A" is for "Apple." But the letter "A" can be used to create many more words than "Apple." Likewise, the student learns that the Fool means "beginnings." So when they get the Fool, they might consider if anything is new or beginning. The Fool, however, can also mean being foolish, or being carefree, or, given the image, taking the dog for a walk. These pages will give you meanings that are generally agreed on, like the sounds of the letters of the alphabet. They will allow you to discuss the cards with other students of the tarot. As you gain a deeper and better understanding of the cards, however, putting together those cards into words and words into sentences, you will see that the cards can express a great range of meaning, and there will be differing views on those meanings. Like differing ideas of how to pronounce words or what words can mean. This is fine. Part of the trick to Tarot is getting it to tell you what it wants you, in particular, to know. Do not be afraid to trust your intuition, and remember that there is no rush, no one way of learning. Use whatever method or combination of methods help you to hear what the cards have to say. If a deck is called a "Tarot" deck then it is likely based on one of three decks: Rider-Waite (creator Arthur Edward Waite), Thoth (creator Aleister Crowley), Marseilles (creator unknown). This book uses the Rider-Waite deck as that is the best known deck and the one that ninety percent of the decks use as their inspiration. You may have already fallen in love with a deck, and that's all right. 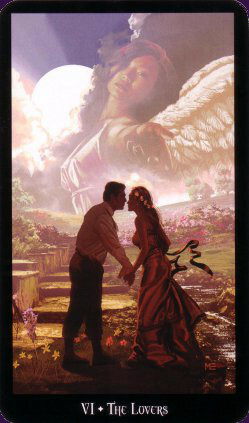 Be aware, however, that if you use another deck with these meanings, some of the images described might not match up to what you see on your cards, as deck creators make changes to the images according to their own artistic inspirations or the theme of the deck. Most importantly, do not feel that you have to learn all 78 cards at once. Get to know the cards as you would get to know people, go at your own pace learning as many or as few at a time as feels right to you. Learn all 78 tarot card meanings, symbols and stories in the complete eBook.